One of the advantages of a push-pull power amp design, compared to a single-ended circuit, is that the net DC current through the core of the output transformer is zero, assuming the plate circuits are perfectly balanced. This is because the DC currents in the two halves flow in opposite directions, as shown by the red arrows below, thereby creating opposing magnetic fields that cancel each other. Reality isn't quite so perfect, especially for Class AB, but to a great extent the core of a push-pull output transformer is only subject to AC signal current. A single-ended transformer, on the other hand, needs to handle the AC signal superimposed onto a large DC component, which requires special construction techniques to be used to prevent magnetic flux saturation. Push-pull transformers are spared these concerns. Moreover, they can be made significantly smaller for the same output power, which reduces cost, weight, and inter-winding capacitance. Mesa Boogie's patent number 7,173,488 describes a simple technique to enable a push-pull transformer to operate in single-ended mode while maintaining zero net plate current through the transformer core. The inventor is Randall Smith and the patent was assigned to Mesa Boogie on February 6, 2007. Let's take a closer look. When the DPDT switch or relay is thrown to the right, connecting D to F and A to C this is a conventional push-pull power amp with cathode bias. The cathode resistor consists of two resistors 19 and 20 in parallel. The power amp is switched into single-ended operation by shorting the grid circuit of one power tube to ground and decoupling the power tube cathodes. Shorting one grid to ground disconnects the power tube from the phase inverter so that only the upper tube is actively driven by the guitar signal. The cathodes are decoupled to keep the active tube from driving the inactive tube via their connected cathodes. 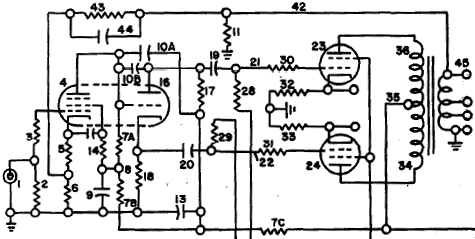 If the power amp is fixed bias, then grid resistors 7 and 8 are connected to the negative DC bias supply instead of ground. 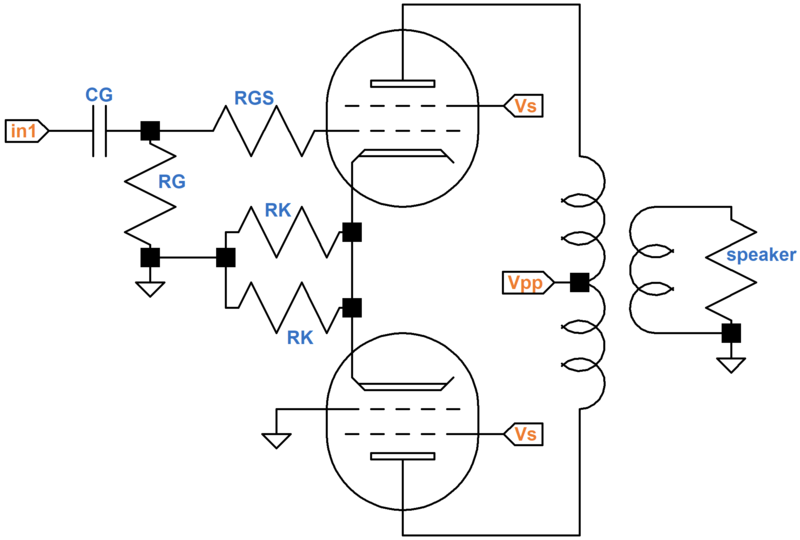 To transform a fixed-bias, push-pull amplifier to single-ended operation the grid of the power tube is connected to ground via a large capacitor, thereby shorting audio signals while preserving DC grid bias. The inactive, lower power tube also remains at its DC operating point but it has no AC component. The net DC current through the transformer core is approximately zero, enabling the push-pull output transformer to cheerfully operate as a single-ended transformer without suffering from magnetic flux saturation. The patent claims all "variations and modifications" of the circuit, as is typical of patent documents. Here are some of the more obvious ones that come to mind. To transform a Class A push-pull amplifier into a Class A single-ended amplifier, resistors 19 and 20 can be equal to twice the desired cathode resistance for push-pull operation. Class AB power tubes, on the other hand, are biased closer to cutoff. Their DC operating points are unsuitable for either the active or inactive phase of single-ended operation. The DC operating points for Class A single-ended and Class AB push-pull operation are substantially different. One solution is to insert a third resistor in series with 19 and 20 for push-pull. Another, even simpler approach is to create separate cathode circuits for each mode and switch cathodes 17 and 18 between them. This technique also enables a cathode bypass capacitor for Class AB to be conveniently inserted. Even if push-pull is pure Class A, which doesn't require a cathode bypass capacitor, the active power tube has less voltage gain when operating in single-ended mode. Because of negative feedback caused by cathode degeneration, it takes more guitar signal to drive the single-ended tube to full power. Because of negative feedback not present in push-pull mode, more guitar signal is required to drive the power amp to full power. The two modes therefore have substantially different input sensitivity. A standard solution is to place a cathode bypass capacitor in parallel with resistor 19. This creates a more constant input sensitivity between the two operating modes. With the capacitor, single-ended mode has substantially less volume, as expected, but it breaks into overdrive with the same amount of pressure on the guitar pick. Using their cathode circuit we eliminate the need for a switch in the cathode circuit. Mesa Boogie's DPDT switch then becomes just an SPST switch between D and E. This remaining switch, which is the heart and soul of Mesa Boogie's invention, simply shorts audio frequencies at the grid of one power tube to ground when overdrive at lower volume is desired. Shorting the inactive tube grid to ground places a constant load equal to grid resistor 8 in parallel with grid stopper resistor 6 across the output of the inactive phase of the phase inverter. Since the grid stopper is usually much smaller than the grid resistor, the phase inverter needs to supply much more current. 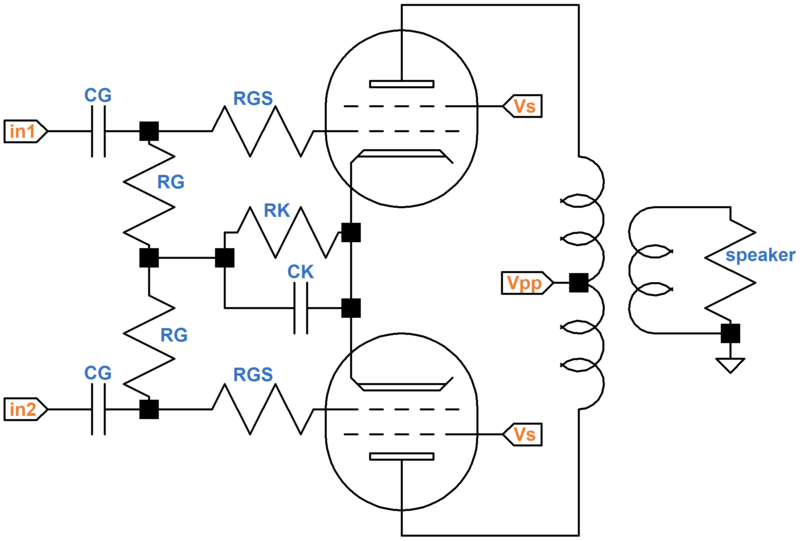 Many power amp designs have no grid stopper at all, so shorting the grid to ground results in the phase inverter driving a short circuit at audio frequencies. This is completely different from normal push-pull operation, where the phase inverter experiences a demanding load only in overdrive as it attempts to drive the power tube grid positive. Finally, transformer primary impedance should be considered. The desired plate-to-plate impedance for an efficient push-pull amp may not create the desired power level and harmonic content when switched to single-ended mode. Modifications to the primary or secondary circuit to tweak the two operating modes may be required. Even with careful impedance selection we can't expect a push-pull Fender Deluxe 5E3 to sound like a Champ 5E1 when switched to single-ended operation. Nevertheless, the possibilities for two uniquely appealing amplifiers playing through a single transformer certainly exist. Mesa Boogie's patent selects push-pull or single-ended mode with a single switch, but what if we wanted a continuous range of operation between the two extremes? What if we wanted to replace the on-off switch with a master volume control capable of continuously adjusting between push-pull at one extreme and single-ended operation at the other? Martin Kiebert's Self-Balancing Amplifier3 shows one possible implementation. His approach replaces Mesa Boogie's SPST grid-circuit switch with two cascode circuits that detect the amount of DC current imbalance in the output transformer and adjust power tube bias accordingly via a pair of cathode followers. Kiebert eliminates magnetic flux saturation dynamically, based on the actual balance between the power tubes. His design anticipates that power pentodes may not be well matched and provides overall bias adjustment in response to varying tube transconductance. To use his plug-and-play approach all we need to do is attenuate the audio signal at capacitor 22 with a potentiometer. At maximum we create "self-balancing" push-pull. At minimum we effectively short the audio for one phase, just like Mesa Boogie's switch. Kiebert easily could have envisioned that shorting the grid of one tube to ground would force a push-pull amplifier into single-ended operation. He also would have well understood that this results in an increase in harmonic distortion and a lowering of maximum power output. What would have been very difficult for him to imagine, however, is that someone would find this particular application useful. Imagine paying more for a switchable option to increase distortion at lower volume levels. Guitar players are anything but conventional.